A look at an interesting performance facet of condenser and dynamic microphones. 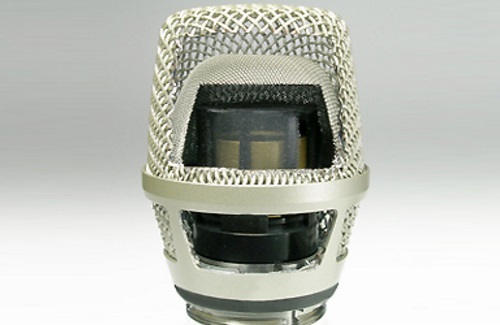 Cutaway view of a Neumann KK 104 S cardioid condenser capsule head. Many believe that condenser microphones are more sensitive than dynamic microphones (moving coil) and therefore pick up “everything,” e.g., stage wash and noise. Most condenser mics are indeed more sensitive. A Neumann KMS 105 condenser with a sensitivity spec of 4.5 millivolts at 1 Pascal (4.5 mV/Pa) is 15 dB more sensitive than an Audix OM7 dynamic with 0.8 mv/Pa. Many artists judge their distance to the mic based on the grille, not the actual position of the (often hard to see if not invisible) capsule, which in most dynamics is typically closer than in condensers. At 1 centimeter (cm) to the grille, the KMS 105’s capsule is approximately twice as far (-6 dB) in comparison to the OM7. Doubling the distance to the grille (2 cm) translates to a 5/4 or 120 percent (-1.9 dB) increase for the KMS 105 but a 3/2 or 150 percent (-3.5 dB) increase for the OM7. Doubling the distance again (4 cm) translates to a 7/4 or 175 percent (-4.9 dB) increase for the KMS 105 but a 5/2 or 250 percent (-8 dB) increase for the OM7! The accompanying chart (directly below) showing SPL loss rates clearly indicates that the greatest rate of change occurs within the first 10 cm. This makes dynamics much more responsive to a change in distance, which is the reason why artists need to maintain their distance and stay on top of them. Inherently, this increased responsiveness also makes dynamics more prone to tonal changes caused by proximity effect. So in a way, one could argue that condensers are actually less “sensitive” to these issues. The caveat, however, is that all things being equal, accounting for the increased offset in capsule depth between dynamic and condenser mics by means of gain results in an inversely proportional increase in terms of stage wash or noise for condensers. Due to the KMS-105’s capsule being removed twice as far (-6 dB) in comparison to an OM7, electronic compensation of the SPL loss due to increased distance not only raises the level of the direct sound but also the level of the indirect sound, e.g., “everything” else. These relative differences between dynamic and condenser mics are most notable in very close proximity to the grille, where the offset in capsule depth is still relatively great. At greater distances the offset becomes trivial, which is apparent from the way that the loss rates in the chart start to run parallel to each other. Capsule depth is the reason why a dynamic makes sense on a loud and/or noisy stage, provided the artist stays on top of it. Otherwise the advantage is quickly lost. Check out this video by Dave Rat to hear the effect of capsule depth for the microphones used in this article. Live Sound Engineer, Harlekijn Holland B.V.
Based in The Netherlands, Merlijn van Veen (www.merlijnvanveen.nl) is a noted audio educator, and he also serves as senior technical support and education specialist for Meyer Sound.